Lily's Ink Pad: Christmas Photo Card...Sara and Bubba Style! Christmas Photo Card...Sara and Bubba Style! As I wrote before, I participated in many swaps in September. One was a Christmas Photo Swap. When I designed the card, I was in love with my Big Shot (and still am). I wanted something simple. Anyone who is making photo cards needs a quick idea. 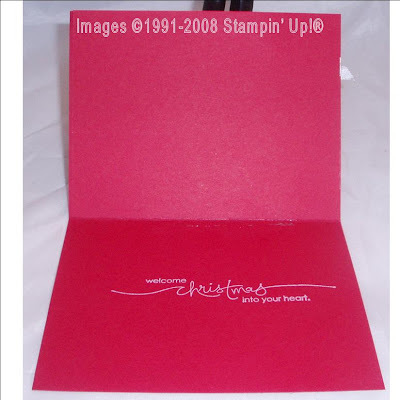 I used White Craft ink in my uninked cartridge over the red paper. I then put the paper through the Big Shot to cut the frame out. I then inked and embossed white snowflakes on Real Red and then punched out the parts I liked using my 1 1/4 inch circle punch. I layered this circle on whisper white and added it to the frame. I tied a small knot around around the frame. The one I took pictures of was my worst bow! I sent the others to the swap. Finally, I added my picture to the frame (I had to trim a little) on a matte. On the inside, I embossed the White Craft Ink with White embossing powder to so the sentiment popped! On a side note, the picture is of my husband, Bubba, me, and the guys we take care of and that live with us. We are each wearing a Santa hat of the team of our choice: The Wisconsin Badgers (Go Big Red), the Chicago Cubs, the Chicago Bears, and, of course, the Raiders. We intended to send this picture as last year's Christmas picture, but never did. Maybe this year! Really cute idea! I'm going to have to remember this one! 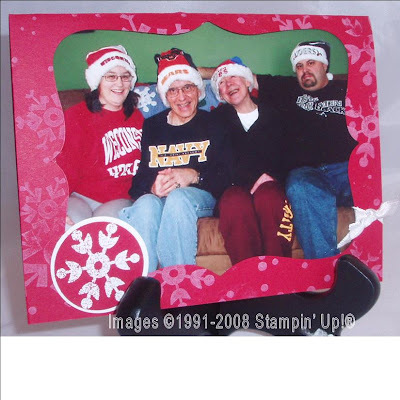 This is a cute idea, I'll have to show this to my cousin she always makes their christmas card with their picture in it. We love to send a family pic tucked inside our Christmas card, but you've inspired me to try and put it on the front this year! Great card which shows alot of personality for family and friends... TFS!